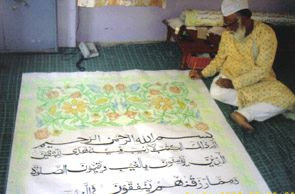 AJMER, India--Sayeed Najmul Hasan Chishti, 56, has prepared a 63 pages, 8 feet broad and 5 feet long. Quran-setting the new world record for the Biggest hand-written Quran. "It's the biggest Quran in terms of size and font, which was compiled in one volume," Chishti said, adding, "It has 63 pages and the size of each page is 60x88 inch." "Each page has a colourful border around the text, featuring flowers of different sizes and seasons," he said, adding, "At the beginning of each surah (verse), the word ‘Bismillah' (in the name of God) is written in a different calligraphic styles, which go back to the Prophet Mohammed's time," he said. Chishti, a Sufi research scholar and a khadim at the dargah, said the Quran represents the true essence of Quranic calligraphy. "I feel honoured after accomplishing the gigantic feat," he said, add-ing that every page has an average of 40 lines. Chishti said he began his professional life as an Urdu teacher in a government school, but gave it up in 2003 for the devotional endeavours. "Thereafter, I dedicated my life to this Quran," Chishti, who is also a Urdu poet and writer, said. He has used a special kind of paper that absorbs the ink and does not get smudged. The letters measures 2 to 3 inches. He has used golden lettering in all those places where the word Allah appears. He said the moral support of his family was crucial in accomplishing the extraordinary feat. "My family supported me with creative ideas to enrich the style of writing. Valuable suggestions from my daughters helped me in coming up with innovative styles of calligraphy," he said. On the occasion of 796 Urs of Khwaja Garib Nawaj Chisti the devotees will be able to see the biggest Quran of the world which will be kept in the dargah premises. The dargah committee agreed to display the Quran for Zayreens who will come here to participate in the Urs. You're so awesome! I do not suppose I have read through something like that before. So good to discover somebody with some original thoughts on this subject. Really.. thank you for starting this up. This web site is one thing that is needed on the internet, someone with a little originality! It's a shame you don't have a donate button! I'd without a doubt donate to this fantastic blog! I guess for now i'll settle for bookmarking and adding your RSS feed to my Google account.